The past two weeks where like usual gone before you know… I had a lot of work with renovating the house and if I’m doing that the time past by so fast… And also in the evening I’m completely broken. 😉 But luckily I also did some other things like a casting for a movie and I also went shopping in Ghent. 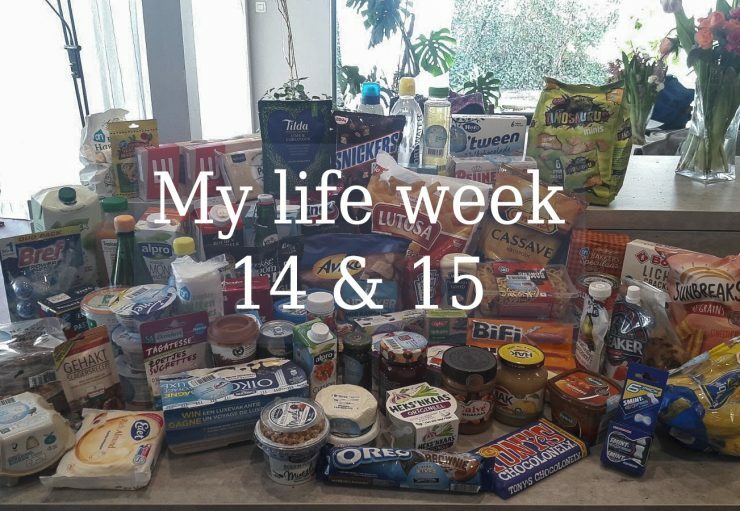 Are you curious what else I did these two week? Then keep on reading! On Monday my boyfriend and I went to a market. And he bought a pomegranate and two avocado’s. And now you may guess how much he needed to pay… He payed for these 3 pieces €8, say whaaat?! That is so much, especially because the pomegranate wasn’t that good. And we always thought that the market was cheaper, wrong thinking… But the lovely pasta pesto made much good! Tuesday I was busy with the albert heijn bingo seals. We had a lot of seals gotten and found. So to get our bingo carts full I posted in special fb group for this to exchange seals. This toke a lot of time, but it was for sure worth it because now all our carts are full! It was so long ago that I visited a wellness. So Thursday it was time to just relax the whole day and enjoy the wellness. We went to the ‘thermen Londerzeel’, I visited this wellness in the past already. But it is such a beautiful wellness! And the photo on the right euh, yes… I blurred it a bit, because just when I left the wellness I had so much bad luck. I just wanted to close my purse and a bird just pooped all over my bah. Aaarg, those birds has so much place and yet they pooped on my bag. So yes, it was bye bye relax feeling. Friday morning it was time to exchange the bingo carts for the free products. It was a lot of searching so I went to the supermarket when it was quite. And whow, almost whole the cart was filled with free products. In the afternoon I went for a good veggie bagel with hummus and tomato salsa. And then it was time to start back with renovating the house. Saturday I passed by, by my mum and we went for a sandwich. And wow, this sandwich with hummus, avocado and more was way too good! Monday and Tuesday I was at work and I forgot to make pictures. But Wednesday I started my day with the free banana pancakes from the bingo. And with some agave syrup and cocos over it are these pancakes so good! After that I left for a photoshoot. It was so long ago that I did one and it was for sure a special shoot. But when I get the photos I will show them of course in a my life article! And on Friday I went shopping in Ghent with a sweet friend of mine. And in the afternoon we went of course to the McD . And the veggie maredsous wrap is freaking good! And with two shopping bags it’s was time to go back home. I bought a lot in the primark but also in the H&M. And this where my two week and for these two weeks I also have some excited things planned… Because I’m going to follow a dj class and the week after that it are press days and the clouds of fashion closet sale! Following a dj class sounds really interesting! Wat een leuke week heb je achter de rug! Ben reuze benieuwd naar je foto’s van de fotoshoot!